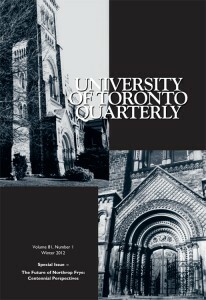 University of Toronto Quarterly 81, no. 1 (2012): 1–186. Special Issue: The Future of Northrop Frye: Centennial Perspectives. Articles by Michael Dolzani, Merlin Donald, Travis DeCook, Ian Balfour, Jean Wilson, Yves Saint‑Cyr, Adam Carter, Jonathan Allan, Gordon Teskey, plus an interview with Margaret Atwood by Nick Mount, responses to Frye by nine poets, and a previously unpublished essay by Frye on poetic diction. Ellipse: texts littéraires canadiens en traduction/Canadian Writing in Translation 87–88 (2012). Giant in time/un géant plongé dans le temps: An Anthology of Writings in Honour of Northrop Frye’s 100th Birthday/Textes en homage à Northrop Frye à l’occasion de son 100eanniversaire. Articles on Frye by Susan Glickman, Michael Happy, Serge Morin, and Bruce Powe, a memory of Frye by Robert Denham, Yann Martel’s “Letter to Stephen Harper,” poems by Troni Grande, Nella Cotrupi, and Valerie LeBlanc that engage Frye directly, poems by Paul Bossé, Gabriel Robichaud, and Jessie Robichaud that take their inspiration directly from the Frye Festival in Moncton, works by Lee D. Thompson, J.D. Wainwright, Jim Racobs, Edward Lemond, Anne Leslie, and Daniel Dugas that were written “in the spirit of Frye,” and other stories and poems, with no direct connection to Frye, written in his honor. English Studies in Canada 37, no. 2 (June 2011). Special Issue: Northrop Frye for a New Century. Ed. Mervyn Nicholson. Reflections by John Ayre, Stan Garrod, Monika Hilder, William N. Koch, and Rick Salutin. Articles by Melissa Dalgleish, Timothy A. Delong, Robert D. Denham, Diane Dubois, Paul Hawkins, David M. Leeson, Duncan McFarlane, Mary Ryan, and Sára Toth. Here we consider the first of these, the UTQ special issue, edited by Germaine Warkentin and Linda Hutcheon. The editors’ introduction rehearses the debates surrounding Anatomy of Criticism, and then moves on to express the hope that the essays in the special issue, “The Future of Northrop Frye: Centennial Perspectives,” will reveal “what a critic of today will find challenging, provocative, fruitful, and productive in the rich record of a critic at work” (7). The editors hasten to observe that this rich record includes the previously unpublished writing which, with the launching of the Collected Works of Frye project, began to become available in 1996. The new material more than doubled the Frye canon, the Collected Works having brought to light almost ten thousand pages of previously unpublished writing, constituting now some 58% of the total Frye canon. We are encouraged to think that the contributors to the special issue will take advantage of this new material. But except for Michael Dolzani, and to a lesser extent Ian Balfour, Travis DeCook, Yves Saint‑Cyr, the contributors are practically silent about anything Frye wrote, especially the holograph texts, during the last decade‑and‑a‑half of his life. The last volumes of the Collected Works came off the presses only two years ago, and no one can be expected to have read the 4,700,000 words that constitute the thirteen volumes of the previously unpublished material. But even the published work of the late Frye, beginning with The Great Code and continuing through Words with Power, Myth and Metaphor, The Eternal Act of Creation, and The Double Vision, gets only the scantiest attention. Toward the end of their introduction the editors do remind us that Frye’s career is rounded off with his two books on the Bible, but the contributors remain largely silent about the great burst of activity in Frye’s final years. Why the lack of attention, even resistance, to the religious accent that is sounded so strongly in the last decade of Frye’s life? The editors do say that from the pages of the CW as a whole “emerges a picture not only of Frye the literary theorist, but Frye the historical and social thinker, the theologian, the musician, and the satirist” (6). I don’t see much evidence for calling Frye a theologian, but there is a wealth of evidence for calling him a religious visionary, one who is on a spiritual voyage. The editors indicate that Frye “addressed a wide audience, not only a purely literary readership, but students of music, history, science and the general public as well” (9). Anyone who has read the books from the 1980s and early 1990s and especially anyone who has looked into the Late Notebooks will find it strange that students of religion have been excluded in the editors’ understanding of Frye’s readership. This entry was posted in Reviews of Books and Journal issues on Northrop Frye, Robert D. Denham Library, Uncategorized on July 10, 2012 by Bob Denham.